How cute! I will definitly have to try this one out. :o) TFS! WHat a lovely bag!! You have some terrific patterns on your blog-- thanks for sharing! This is a gorgeous bag! Thank you for sharing it! Congrats Kami on winning the Prize.. I don't know what it is but I am sure you will LOVE it.. 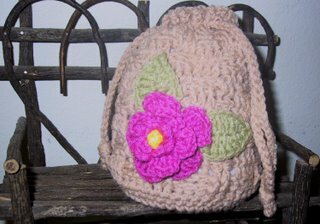 So nice to have you knitting at your age... Maybe you will be a knit designer when you get older..
.... i love this bag!!!!!!! I just made it and it is perfect for my two year old daughter.... I just have a question, I want to make it bigger... how do I make the bottom bigger with increases and stuff?? Thanks so much!! Just increase the same as the pattern does, each round work one more dc before the 2 dc in next st.
Wow! What a wonderful site of original patterns! Thank you so much for sharing your patterns. They seem to be so difficult to find these days. I really appreciate your generosity. It will make my dyas ever so much more pleasant making wonderful things. I love the designs on this backpack. I can't wait to get started, except will someone please tell me what is the CD in the instructions. Thanks!! Like you put in a computer. It makes a nice stiff bottom, but is optional. Thank you for the info. Now I can get started.